Yes. Because while staring at Barack Obama’s scrawny look on CNN might give you the impression that, underneath that cover, he’s fragile and feeble—think again. He’s not. Superman? Is he? Is there an “S” hidden underneath that dark suit? Ha-ha. It’s New Year’s Day—not April Fool’s Day—so I won’t lie to you in saying that he’s Will Smith-muscular. But this I’ll write: Based on fitness levels, he’ll beat you and me. Consider that for 48 days without miss until Christmas, while he debated John McCain, flew from Florida to New Mexico, declaimed speech after interview after oration—Obama never missed one activity each day: Exercise. That’s incredible. A man so busy—maybe the busiest on this planet—ensuring that he sweats for 90 minutes every 24 hours, seven out of seven days. To me, a self-confessed fitness fanatic, that’s fascinating. 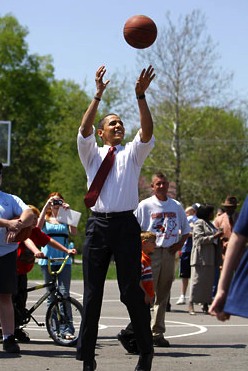 Obama plays basketball—and he’ll soon build a full-court at the world’s most popular home. 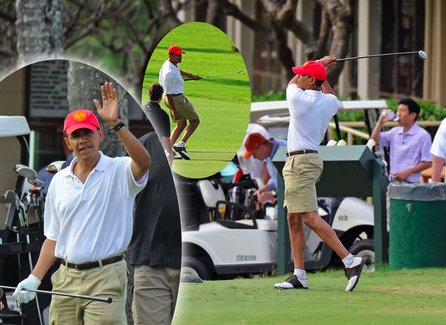 He swings at golf. Bowls. (Well, the last time he did, at a campaign stop, he shot 37. Our very own Mic-Mic Miranda can beat that with three straight strikes!) But his most steady form of perspiration? The gym. Remember his victory speech at Grant Park? Celebrating into the morning’s darkest hours, by 9 a.m. the next day he’s exercising. Just hours before flying for his 12-day vacation? He slips his Asics sneakers and runs. The next morning in Hawaii, his first agenda? To soak in sweat. 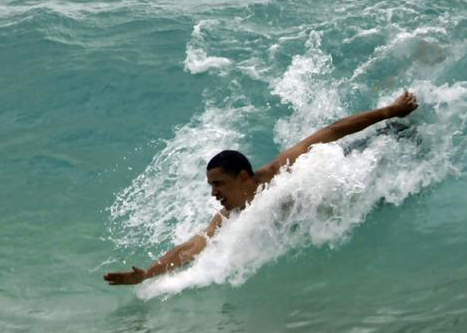 This “Obama exercise-lifestyle” wasn’t inborn. It began when he was 22 and a student at Columbia University who, in his book, ‘Dreams From My Father,’ was a casual drug user and underachiever. That is, until he shifted to R & R: reading and running 5 kms. daily. “Physical fitness yielded mental fitness, Obama decided, and the two concepts have been married in his mind ever since,” added Saslow. Now, let’s pause. Does all this matter to you and me? It does. Think about it. We all own the same 1,440 minutes each day. And my hope is that none of us will ever use that most common of alibis for not sweating-out: I have no time. If you do…. Think Barack. Happy New Year! My wish is for your better health—so better exercise—this 2009.
stay cool and always be kind to all…your very handsome mr. President..god bless..from Philippines.